Revising Reality is off to an amazing start. We have sold an incredible number of copies. However, I took the book offline for two days to upload an updated version that includes fixing a number of typos that annoyed me, and adding this “Editor’s Overview” which I had been developing for a backgrounder for interviewers. We decided it would be essential for all readers. It provides the context for the book so that readers know where we are going. If you have already bought the book, please enjoy reading this overview. When the Kindle Version is ready (which will be in a few days), you will be able to download a Kindle version for free from Amazon if you have already bought a printed copy. 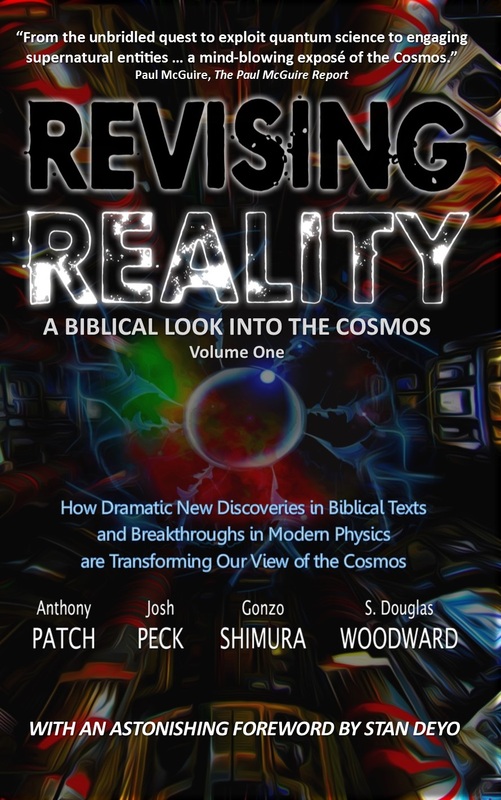 I hope you find this document useful regardless of whether you have read or intend to read, Revising Reality: A Biblical Look into the Cosmos, Vol. 1. Be looking for Anthony Patch interviews. He is very busy doing radio shows and advancing the research and thinking on the topics. Christians today lack wisdom concerning the nature of the creation. Science has taught us many false theories about the structure of the universe from the smallest particle to the largest galaxy. New scientific discoveries as well as authentic insights into the ancient text of the Bible give occasion to revise our understanding in accordance to what the Lord God would have us know about Him and His creation. This book blends the efforts and insights of four researchers and writers, drawing further wisdom from the writings and teachings of many more scientists and biblical scholars. Our intent is to enable you, the reader, to revise your understanding of reality. The first and foremost premise is that the Cosmos was created by the Word of God. “In the beginning, God created the heavens and the earth” (Genesis 1:1, ESV). “In the beginning was the Word, and the Word was with God, and the Word was God. He was in the beginning with God. All things were made through him, and without him was not any thing made that was made.” (John 1:1-3, ESV) Cosmology begins with God creating. The Bible is a book that begins and ends with Cosmology. God created an “ordered creation” according to the witness of Genesis. However, the creation appears to have been in a chaotic state, a “wasteland” formless and void when He restored it. It was deluged with water from a prior state. After its restoration, the creation was very good. Humanity will one day soon be glorified to reign with God over the Cosmos. God created humankind as men and women. In His Image He created them. He has redeemed the creation through Christ and will recreate the Cosmos restoring humanity to its proper place – in fellowship with Him and to rule and reign over the Creation with Him. The universe has a unifying “atmosphere” which permeates all of reality. This “Cosmos” has given birth to galaxies, stars, and planets, at the macro-end of existence while it consists of atoms and quanta: the smallest particles at the micro-end of existence, e.g., quarks, gluons. The standard academic view asserts 96% of the universe cannot be discerned by humanity through any of its instruments. We believe this is one of the principal falsehoods of academically accepted science. The “standard model” asserts that space is a vacuum. In contrast, we believe space is filled was ionized gas known as plasma. The plasma serves as a medium throughout the universe to propagate electromagnetic waves between heavenly bodies, just as air propagates sound waves within the atmosphere of earth. This substance is known as the “aether” (the Greek word for atmosphere). Science has debated the presence of the aether for centuries. The Bible seems to imply that the aether exists throughout the heavens. Many scientists today that challenge the standard model assert this aether has been proven to exist in numerous way. Secularism and atheism oppose what the Bible teaches about how the Cosmos began and how it will end. “Scientism” has persuaded us all into believing the universe began with a Big Bang and expands endlessly until it eventually dies a cold death of entropy billions of years from now. Paradoxically, despite this dismal fate, science asserts the universe is guided by a non-sentient evolutionary principle that thrusts us toward progress. Supposedly, life inevitably exists and evolves everywhere throughout the universe. Evolution cannot be detected by instruments or proven in the laboratory. Its evidence in geology and biology is inconclusive. However, the standard academic viewpoint asserts that evolution is a proven fact. Thus, Scientism demonstrates that it is built upon unprovable axioms and thus, draws conclusions about the nature of reality that become a matter of faith more than science. The Cosmos, from a secular atheistic perspective, does not vindicate any claims to “right or wrong”. For morality to exist with “ultimate consequences” for doing good or doing evil, there must be a God to enforce right values. Modernity generally rejects any notion of a personal God (Theism) and therefore, assumes that morality and the importance of following conception of “right and wrong” are baseless. The only way to ground moral action is based upon humanity’s “will to power” (i.e., willing it so). According to infamous German philosopher, Friedrich Nietzsche, since God does not exist, morality does not exist. Thus, at its core, the universe is amoral. Humanity’s sentiments toward right and wrong are not grounded in a Divine Judge because no such judge exists. From the vantage point of atheism, only the Übermensch can resolve this dilemma. Man must choose what’s right and wrong, period. Our reality is fluid (unstable) and threatened by natural mechanisms “built into” the universe. According to Einsteinian physics, the speed of light is a constant that cannot be exceeded; gravity is the dominate force in the universe; existence is haunted by black holes and is comprised mostly of dark matter and dark energy. Time and space are interwoven. Energy consists of mass multiplied by the speed of light, squared (E=mc2). Objects with great mass can bend space and time. What seems “solid and sure” is actually relative to the mass of an object and its speed traveling through the Cosmos. Furthermore, scientists now assert we cannot really be sure our experienced existence will remain constant and “settled” (our past, present or future) as parallel universes may exist promising potentially different outcomes and altered histories. Humankind’s religions are built principally around three diabolical ideas. One: the creation is flawed because matter is flawed. Evil results from the flaws embedded within our reality. Whoever made the creation did not have the will or ability to make it good. Two: humanity is a creature able to achieve godhood and/or reach immortality after this life. We can overcome the limitations of the flawed creation by recognizing a spiritual reality that supposedly suffuses the entire universe. It is called by many names. In our day, the notion was once entitled “cosmic consciousness”. This divinity can be accomplished through following particular religion practices, based upon acquiring special knowledge (gnosis) or conducting rituals (prayer, conduct of good deeds, obeying religious laws). We must accept the axiom that spirit supersedes matter. According to most religions, matter may be an illusion. Reality itself may be an illusion. Even some conservative Christian theologians suggest reality may only be a hologram – a projection of the mind of God. Three: human religion falsely assumes that power exists that enables us to achieve complete enlightenment. This power is sometimes called “the being of light” or Lucifer. It comprises a force or principle in the universe which expands our capacity to understand and to influence existence, and wants to guide humanity to fulfillment. Even a “non-religion” like Freemasonry, asserts that the initiated can learn cosmic secrets and the god Lucifer will instruct them. Philosophy of religion posits that good and evil are either impersonal forces that exist in the universe or complete illusions that do not exist at all. In opposition, Judeo-Christian teaching asserts that they are personages not forces: Jehovah is the first such person who exists prior to everything else and is the Elohim of elohim. He created every other personage in the entire creation: whether seen or unseen by human beings. He is known to Jews as Yahweh, but to Christians as Father and Son: His name is Yahweh or Jehovah. He is also the “Angel of God”, Y’shua, or Jesus Christ. His Holy Spirit comes to dwell in us if we receive Him and welcome Him into our lives. Christians see this Spirit as fully personal also, the third member of a three-in-one godhead, the Trinity). Yahweh’s principal adversary is Satan (which means adversary) who turned against Him at some point in the past. He stands opposed to God, but he is not the opposite of God. His name, Satan, means adversary. His rebellion was at least thousands of years ago in terms of earthly chronology – or perhaps even further back, in eons past, when Satan first sought to usurp Jehovah’s rule over all creation. God created both heavenly and earthly beings, choosing to rule with and through them. He created a Heavenly Host or Divine Council (see Psalm 82 and 89), as well as angels that now exist in both righteous and unrighteous states. He ultimately created humanity. Humanity also rebelled against Yahweh. As a result, it now exists infected with an inclination to sin against other humans, the creatures of this world, and God Himself. Nevertheless, humanity has been redeemed by a unique God-man, Jesus Christ. Through Y’shua, God has made provision for humanity to rise above this corruption. This redemption, however, does not apply to the fallen angels. All truly redeemed human beings reflect in part the promise of the coming new world and a perfected humanity. Until the resurrection at the return of the God-man – Y’shua, at the end of this age – humanity will continue to experience death and the consequences of sin, especially if and when we lapse habitually into sin. God’s provision, however, does promise freedom from this sin inclination if we live in the Spirit drawing power from God Himself living in and through us. The creation was corrupted yet again upon the disobedience of the first humans, Adam and Eve. According to the Bible, the tempter was Satan, the nachash, the Hebrew word for snake. Later, we are told that a group of angels fell from heaven (Genesis 6). These angels came to Earth and had offspring with the “daughters of Adam”, called the Nephilim. A non-biblical text, The Book of Enoch, expands on Genesis’ very brief account. It is quoted in the Bible, but cannot be considered authoritative. Nevertheless, it is an ancient text worthy of study. According to its account, 200 angels descended upon Mount Herman (today’s Golan Heights) and inbred with human women creating hybrid offspring. This event was the catalyst for the mythology of virtually all ancient peoples (Sumerians, Babylonians, Egyptians, Greeks, Romans, and Nordic peoples). Many evangelical scholars who have studied this account in depth, in particular Dr. Michael S. Heiser, explains that whether intentional or not, the impact of this angelic incursion into the human race was used by Satan to defeat Yahweh’s plan to redeem humanity setting the creation in order once more. This event was non-trivial. The Christian notion of salvation through the blood of Jesus Christ builds upon rightly interpreting this event. Without this appreciation, Old Testament accounts of giants and the slaughter of the peoples of Canaan by the Hebrews as led by Moses and Joshua, lead to unbiblical interpretations of the nature of God. Additionally, it should be pointed out that the Flood of Noah was (at minimum) God’s interim plan to eradicate hybrid humanity created by these fallen angels and animal chimera they produced. Through God’s plan revealed to Noah, only selected animals (pure ones) accompanying Noah and his family on an ark would preserve life and perpetuate these species on this earth. Nevertheless, after the flood, the Nephilim reappear. Why did these hybrid beings return once more? There are various explanations for their reappearance. In Revising Reality, the authors discuss the possibilities, examining five different theories. They also consider the special abilities of angels, their multidimensionality, whether they might have DNA, and whether Nephilim will appear again in these last days, effectively mirroring “the days of Noah”, for it has prophetic import. Christians today live without awareness that alternative physics reopens the possibility of the supernatural. Although the Bible does not distinguish between the “natural and the supernatural”, humanity does. Since the eighteenth century, the period known as “The Enlightenment”, “standard science” has rejected the supernatural events such as the Bible describes. All effects have natural causes. There are laws that govern the workings of the universe and these laws can be identified and understood. A supernatural event would overrule this view. Despite his deep commitment to a biblical understanding of the Cosmos, Sir Isaac Newton’s understanding of physics and a much less theistic Albert Einstein’s revision of Newton in the twentieth century, provide the vast majority of what science has taught us about physics including reinforcement of an anti-supernatural bias. However, two other scientists confronted the views of Newton and Einstein: Werner Heisenberg and Nicola Tesla. Heisenberg challenged the validity of Newton and Einstein at the quantum level (the tiniest “spaces” in the universe), while Tesla challenged Einstein concerning the dominance of gravity, the “bending” of space, the prominence of the aether (plasma), as well as proposing methods to defeat gravity through electrogravitics. Thus, Christians must now recognize that what they were taught in school may be wrong. Popular astronomers and cosmologists today continue to reinforce many falsehoods. However, orthodox science as expounded by Newton and Einstein is no longer sacrosanct. There are growing numbers of scientists that challenge the academically accepted cosmology. Thus, there are substantive new insights in physics itself which call for a revised reality. Christians are unaware there is a new school of science that better reflects biblical cosmology and rejects secular/atheistic cosmology. Although scientific orthodoxy still insists upon the notions of dark matter and dark energy, black holes, and the constant of the speed of light, there are now an increasing number of scientists that question the validity and universality of these assertions. In particular, a new school of scientists have begun to propound The Electric Universe. This group of mavericks comprise the Thunderbolts Project. They have been rethinking the nature of the Cosmos. Their ideas acknowledge much of the so-called “standard model”; however, they depart in a number of areas based upon the work of Tesla and the notion of the fourth state of matter and energy (i.e., plasma). According to them, the dominant force in the universe is not gravity but electromagnetism. They point out that even Einstein could not reconcile certain “real-world” phenomena with his theories. In particular, particle entanglement, also known as “spooky action at a distance” infers that the speed of light is no longer a constant (it can be exceeded). Entangled particles “communicate” instantly no matter the distance between them. Because of these new developments, our conception of reality is in need of a vast revision. Practical applications of this quantum reality are being put into place today. Many more will come. Whether following the lead of Einstein or of Tesla, all scientists now believe that the universe consists of multiple dimensions that we cannot see or detect. To some indefinite extent, the Cosmos is a “multi-verse”. There are perhaps as many as ten dimensions plus time. (Whether time in fact truly constitutes a dimension remains a matter of debate too). Because humanity lives within these three physical dimensions of height, width, and depth, it is not obvious to the vast majority of human men and women that there could be other dimensions. Nor is it apparent how we can understand them. Scientists remain certain of the multiple unseen dimensions due to mathematical equations that “make sense” of the un-sensed world. Those persons who profess a so-called “sixth sense”, have a much easier time accepting the multi-dimensional hypothesis. Therefore, since so many acknowledge the multiverse, Christians must revise their reality. These vistas open the door to “supernatural” events without compromising true science. Humanity faces new threats from scientists that also are committed to the occult or pagan views of the nature of the Cosmos. These threats arise from an elite that secretly embraces the new physics of an electromagnetic universe along with commitments to what Christians would consider satanic forces that exist beyond the three observable physical dimensions of nature. The consummate work of this group is the greatest machine ever built by humanity, the large hadron collider (LHC) at CERN near Geneva, Switzerland. Scientists at CERN admit they seek to discover the existence of all types of quanta such as the so-called “god particle”, the Higgs-Boson. However, as they increase the power of the collisions there, they create dangerous particles known as “strangelets” that sink to the center of the Earth and ultimately, over time, could transform our planet into a neutron star. Even physicist Stephen Hawking contends scientists at CERN “know not what they do”. Strangely, CERN constitutes a new “Tower of Babel” in several respects. 66 nations have united, actively supporting the effort. However, virtually all nations globally acknowledge the work at CERN and hope to exploit its benefits. The leadership behind CERN through its public “mouth pieces” states that their goal is to “open other dimensions” through portals created by breaking the “strong force” (the gluon) and creating a gap through which other universes or other entities can access us and we them. Thus, they hope to “reach unto heaven”. Unofficially of course, CERN may be creating exotic weapons. In fact, two authors of this book propose that like Nimrod who launched a projectile into heaven (according to the Book of Jasher it returned to Earth tainted with blood! ), the forces behind CERN may be seeking to “kill God” in an ultimate statement of liberation from and defiance against humanity’s maker. As at Babel on the plain of Shinar, the effort has brought the world together to act as one. Like humankind working under Nimrod’s rule, CERN is the focal point that seeks for those who endorse and support it to “make a name for themselves” (as was the express purpose at Babel) – to be as the demigods, the Nephilim, the offspring of angels. Today’s movement known as Transhumanism reinforces this objective. Some say we now live in a post-human world because humanity genetically is under modification. The authors believe the meaning of the Tower of Babel comprised a number of significant but ultimately failed attempts: an assault upon God, reopening a pathway to and from the “heavenly dimension”, a statement of defiance that humanity would not allow God to destroy the human race again, and for humanity collectively to become Nephilim or demigods once more apparently in the manner of Nimrod who “began to be a mighty one in the earth” (Genesis 10:8) through a means presumably shown him by fallen angels although not disclosed in the Bible or apocryphal books like Enoch and Jasher. The goal of CERN likewise seeks to defy God, deify humankind, establish human supremacy, “create a ‘stairway to heaven’” once we learn how to sustain gaps in space/time at the gluon level (the “strong force”), and create portals to other dimensions, accessing other beings. This will open the abyss. Our notion of what it means to be human is on the cusp of a radical change. Genetic science as well as information technology are attempting to advance humanity, to evolve humanity to a new state, in which humanity gains immortality and directly “interfaces” to one another and to all machines through a ubiquitous (universal) “internet” transcending all current conceptions. However, the possibility exists that machines will commandeer this transformative process and overwhelm humanity. We could find ourselves slaves to the machines that we have created. Such scenarios behind movies like “The Terminator” are within decades of possibility. Indeed, the likelihood that “true artificial intelligence” will develop is at the core of the thesis advanced by inventor and intellectual Ray Kurzweil concerning the “singularity” which he has predicted will be achieved by 2045. At that point, humanity will no longer control its own destiny. It will be unable to manage advancements in technology. Instead, it is theorized that technology itself will likely control humanity. Thus, the final fate of humanity will then be in question, perhaps gravely so. The real history of our Earth, our sun, our moon, and the entire solar system needs reexamination. Where did life originate? Has our present sun always been our sun? Is the Moon an artificial satellite? Before humanity lived on Earth, did it live on Mars? Why are their petroglyphs around the world that illustrate electromagnetic phenomenon and illustrate undeniable similarity? Was the world created less than 10,000 years ago? Did cataclysms such as Immanuel Velikovsky proposed in his controversial book, Worlds in Collision (1950), actually take place? Were there ancient civilizations with different, perhaps more advanced technologies than what we understand today? What is the empirical evidence to support such radical revisions of reality? These issues will be explored in the Volume Two of Revising Reality: A Biblical Look into the Cosmos. “With this book Immanuel Velikovsky first presented the revolutionary results of his 10-year-long interdisciplinary research to the public, founded modern catastrophism – based on eyewitness reports by our ancestors – shook the doctrine of uniformity of geology as well as Darwin’s theory of evolution, put our view of the history of our solar system, of the Earth and of humanity on a completely new basis – a nd caused an uproar that is still going on today.” (From Amazon’s summary of the book).